The bond between pyruvate and thiame has formed. This places a N+ in the right place t initiate an aldol reaction. Officially Glycolysis ends with pyruvate. There is a problem however; NAD+ was reduced to NADH with glyceraldehyde dehydrogense. NAD+ is in limited supply and must be regenerated in order to keep the pathway running. There are only three carbons in pyruvate and the carbonyl (ketone) is on the middle carbon. This means that the standard rules for and aldol reaction cannot apply - there is no C "two carbons away" This reaction must use thiamine as a cofactor. The mechansim however (once thiamine is covalently attached at the ketone) looks identical to the aldol reaciton that is catalyzed by a Schiff's base. The Standard State thermodynammics favors acetaldehyde and CO2 formation by a factor of ~300. but in fact the reaction is virtually irreversible. This is because CO2 is a gas that diffuses away and opu tof the cell into the surrounding environment and eventually into the atmosphere. It is therefore always at a low concentration. It is very difficult to get CO2 in high enough concentration to reverse this reaction toward pyruvate. Starting from standard state and allowing the reaction to come to equilibrium the acetaldehyde and carbon dioxide concentration would end up ~300 times higher than the product of the concetrations of pyruvate. The Standard Free Energy favors carbon dioxide and acetaldehydeformation. Aldolase. Animation of the Pyruvate Decaroxylase reaction Blue: represents the enzyme. The E-NH2 represents the crucial enzyme active site amino Lysine in their basic (deprotonated). "Start" begins an animation of the aldol reaction. It proceeds through the reaction in the "forward" direction and then "backwards" again. Note how the enzyme is involved. "+" increases speed while "-" decreases the animation speed. 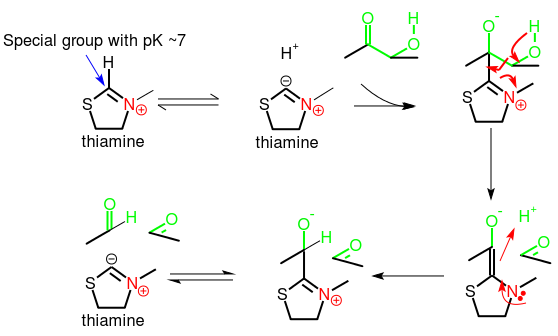 You may also step through the reaction using "next" or "previous"
This reaction happens in three phases: 1: Thiamine adduct formation; 2: Aldol Reaction; 3: Release of thiamine. These phases are labeled in the animation as well. The thiamine adduct is formed to provide the necessary "pulling" force on the electrons to initiate the aldol reaction. Notice: how the "positive charge" on the nitrogen of the thiamine ring begins the process of the electron pulling cascade. Compare the animated reaction to the "arrow pushing" scheme at the right. See if you can correlate the electron movement in the animation to the arrows in the static picture above.